What’s your favorite garden color or combination? Mine change with the season, week, and even the hour. Right now, it’s hard to resist that current cat cove combo—how’s that for alliteration—pink rock rose (Pavonia lasiopetela) and Calylophus berlandieri, where sun beats down on them many hours. I’m just as joyful about this little group in the new front bed. I seeded annual pink Cosmos to fill in while the perennials grow up. Already, I’m a fan of it with perennial artemisia and annual ‘Black Pearl’ pepper (though it returns in mild winters). The den bed goes for a yellow/orange ensemble in daylily season, while ‘Patrick’ abutilon carries my orange torch almost all year. Okay, I admit, I love orange and its various hues. I’m a real fan of ‘David Verity’ cuphea, too, though I don’t have any, until I can snag the sun and good drainage that cupheas like. Daphne makes Cuphea her pick of the week, since they feed butterflies, bees and hummingbirds in summer. Bat-faced (bat face) cuphea (Cuphea llavea) is a darling combo of red and purple that hovers at this garden’s border. It was in Lucinda Hutson’s garden long ago that I fell for abutilons. I also fell for her Herb Garden Cookbook, my go-to book for plant info, recipes, and Lucinda’s vivacious stories. Every page encourages my culinary and plant creativity. Tom reports that her Mustard and Mexican mint marigold chicken is one of his “book mark” faves. Her latest adventure takes us on a spirited tour of Mexico’s agaves, their history, and very tasteful recipes from cantina to cocina. Lucinda joins Tom this week for a fiesta of folklore, the inside story of how agaves turn into tasty drinks, and which one is tequila’s exclusive. On her Life is a Fiesta site, check out her upcoming events, recipes, and links to articles, including her monthly feature in Edible Austin. We’ve taped Lucinda’s garden a couple of times, including her poignant Day of the Dead celebration. In 2014, we’ll take you on a current tour, since our first was pre-YouTube! For now, here’s a cute succulent presentation from an upcycled toy bed frame she found on a curb. Since succulents tend to fiesta a lot, Eric Pedley from East Austin Succulents demonstrates how to control the party and pass it along to friends before the wayward plant police step in. Critters can party down on your succulents, too, like on my Macho Mocha mangave. But who is the real culprit behind this damage? Daphne has the answer, joined by detective (aka Extension entomologist) Wizzie Brown. The little yucca bugs created small spots with their piercing and sucking. The party hounds that trashed the place? Daphne explains when to find these secretive warriors and why not to use snail baits. On tour, let’s head to a romantic garden where web designer Bob Atchison and “The Wine Guy” Rob Moshein host the neighborhood every day and night. 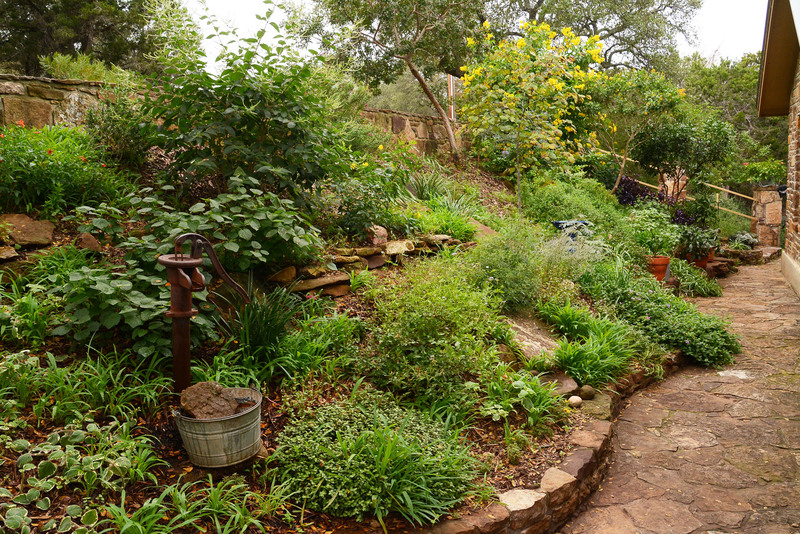 Every week, Central Texas Gardener passes along knowledge, inspiration, wonder and friendships. So now, the CTG team asks for your support to keep this garden growing! You can pledge online ANYTIME for fabulous gifts, including Lucinda’s The Herb Garden Cookbook, Viva Tequila, a Go Local card, and a Roku to watch your favorite PBS and KLRU programs anytime you want! On Saturday, we continue the inspiration after our usual broadcast with two recent favorite gardens: Meredith Thomas and Robin Howard Moore. Join me, Tom, and Daphne from 12:30 to 1 p.m. and 4:30 – 5, to support your CTG team! MANY THANKS from me, Tom, John, Trisha, Daphne and ALL the gardeners who have been able to share their stories and inspiration thanks to KLRU.